Biotech Concepts Ltd. has developed several processes associated with the production of Active Pharmaceutical Ingredients (APIs). Most processes are related to antibiotic production, in particular the to cephalosporin and 7-aminocephalosporanic acid (7-ACA). In general, any overall production process is divided into several sub-processes. These sub-processes can be purchased as such. Where applicable, biological material (production strains) can be obtained. Alternatively, Biotech Concepts Ltd. can adapt processes to best fit the customers needs. If desired, Biotech Concepts Ltd. supports technology transfer and training of personnel on the customer's site. The Technologies page provides more details on the processes we can support off-the-shelf. Routine laboratory work can often be automated. However, the cost of such automation are often too high to justify an investment. In order to overcome this dilemma in the past Biotech Concepts Ltd. has developed a straightforward low-budget approach to programmable automation for lab- and pilot-scale work termed ARMin. ARMin stands for Automatic Regulation of Multiple Instructions, or for Arno Reichert and Wolfgang Min who developed the product. 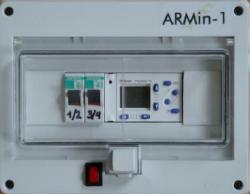 The different ARMin models are small programmable application controllers designed to control up to 6 independet loads. Control is initiated by either a manual trigger or by a limited series of sensors. All I/O signals are digital ‘on – off’ type signals/functions. The unit is programmable via the buid-in keypad or via an object based MS Windows®; based software. ARMin is best suited to control repeating, dependent or non-dependent actions of different duration. Core of the system is a commercially available programmable controller that is fitted into a housing equipped with fuses and switches for save operation. Please refer to the pdf file for further details.